Having such fun working on this mini quilt - more about it here. I solved the quilting dilemma by quilting round and round the central panel in a series of 'boxes'. I've also added some more quilting in coloured threads which runs across all the strips, linking them together. 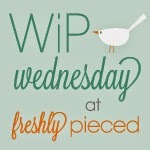 Linking up with Lee today for WIP Wednesday. The colors of this are great... and I love the wavy quilting! Greetings from Germany! Love the different colour quilting - works really well! Delicious colors! Just gorgeous! Love the quilting...beautiful! I love a yummy close-up quilting shot! Gorgeous color and texture! Love it! The different colour thread look beautiful. Oooooooooh! Just love the colors and flow of this! Beautiful! Oh my, your quilt is stunning, Catherine! Everything about this quilt is perfect; the glorious soft, coloured solids, the design and your wonderful quilting. 'Tis truly inspired.....again! Your quilting soloution is perfect! It's looking wonderful!